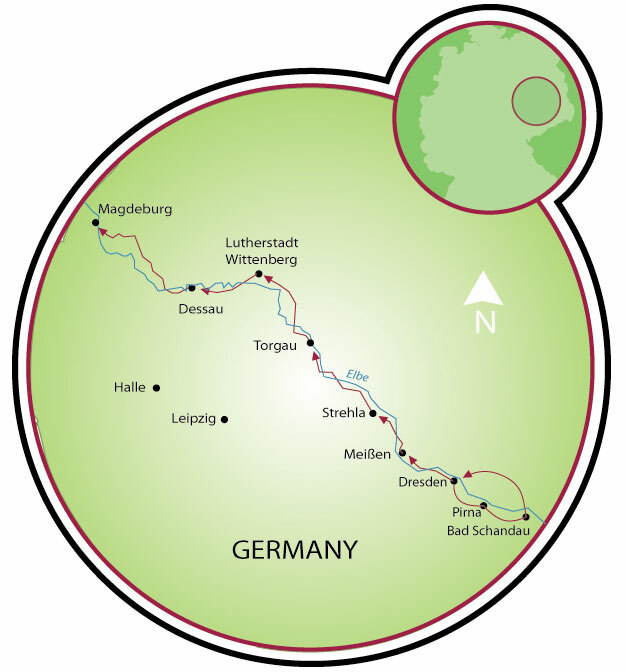 Depending on which of the following bicycle tours you choose, you can cycle a total of approximately 108 miles (335 km) between Bad Schandau and Madgeburg. 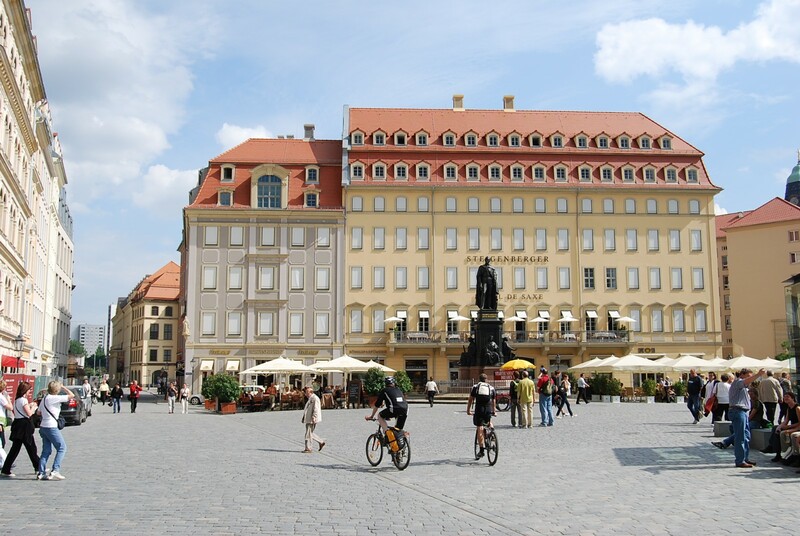 You can start in Dresden with Wittenberg, Dessau or Magdeburg as your destination. Or, reverse the order, start in one of the three towns and end in Dresden. There are 1001 possibilities to combine sight seeing with your tour. Enjoy regional cuisine and wine tasting in pubs and restaurants along the way. A few wine specialties are Goldriesling, Ruländer and Scheurebe. 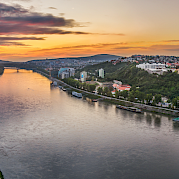 Come along and explore the picturesque landscape from the narrow Elbe Sandstone Mountain Valley to the vast flood plains by Magdeburg. Starting in Dresden in eastern Germany, this tour incorporates scenic river landscapes with palaces and castles, chapels and churches, vineyards and valleys, history and harmony and always, tasty traditional Deutsch cuisine, from sausages to sauerkraut! 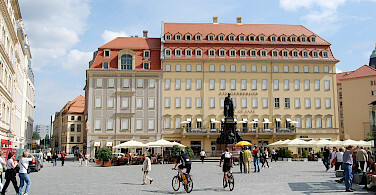 Dresden is known for its Baroque towers and gables. For a great view of the city, climb the dome of the Frauenkirche! This famous symbol of Dresden was recently reconstructed and is considered the world’s finest Protestant church. From the dome, one can see Brühl's Terrace (a terrace overlooking the Elbe River); Semper Opera House in Dresden-Baroque architecture; Zwinger (Baroque buildings enclosing a picturesque garden courtyard); the Catholic Hofkirche (the largest church in Saxony and one of Dresden's foremost landmarks) and the Residenzschloss. The city’s cultural and artistic splendor result from its long history as capital and Royal residence for the Kings of Saxony, and its importance as a cultural center has given it the nickname Elbflorenz or “Florence of the Elbe”. 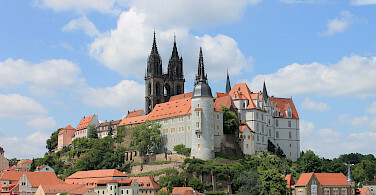 The town of Meißen is dominated by the Albrechtsburg, a 15th century late-Gothic castle that was the first of its kind to be built solely as a residence. 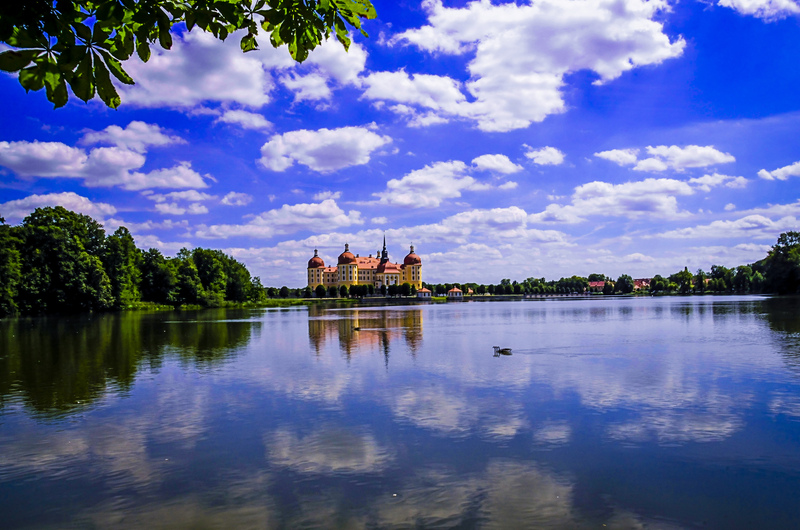 In the historic town of Torgau, you will notice the early-Renaissance Hartenfels castle. 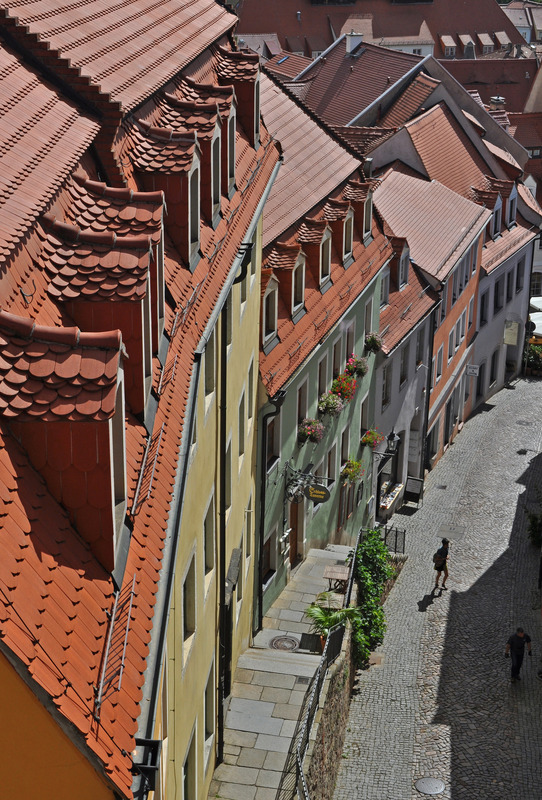 The town of Wittenberg will take you back to the roots of Marin Luther and the Reformation. On the door of the Schlosskirche (castle church) is where the Augustinian monk Luther is said to have nailed his famous 95 theses in 1517, starting the Reformation. 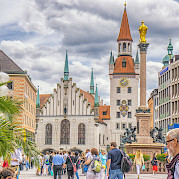 On the market square is the ancient Rathaus with a statue of Luther. 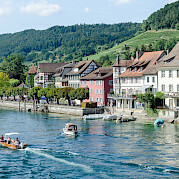 For a full list of options for bicycle tours in Germany, click here! Discounts available for children! Please ask us for details. *Advanced reservation required. Min. of 4 participants. Payable on site. Train from Berlin airport to Dresden, approx. 2-3 hr, cost of ticket approximately €40 depending on connections. Average high/low temperature in °F for Dresden is approximately: 64/47 for May, 70/53 June, 70/53 July, 72/56 August, 66/50 September, & 56/44 for October. Extra nights available in Dresden, Wittenberg, or Magdeburg. Easy self-guided hotel tour with average daily distances of 25 miles per day over good asphalt roads or bike paths and flat terrain. Dresden, also known as “Florence on the Elbe River”, is a cultural metropolis in Saxony. The view from the river towards the city is gorgeous. The Frauenkirche, ‘Church of Our Lady’, Brühlsche Terrasse, nicknamed ‘The Balcony of Europe’, the Semperoper Opera House and Zwinger Palace are just a few points of interest worth visiting. Spend the night in Dresden. The Karl May Museum (Karl May was one of Germany’s best selling authors in the 19th and 20th century) is in Radebeul. 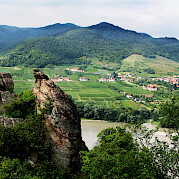 On your way to Meissen it would be worth your while to leave the cycling paths and cycle through the vineyards. You may want to take a nice break to enjoy a delicious glass of wine in one of the rustic inns. 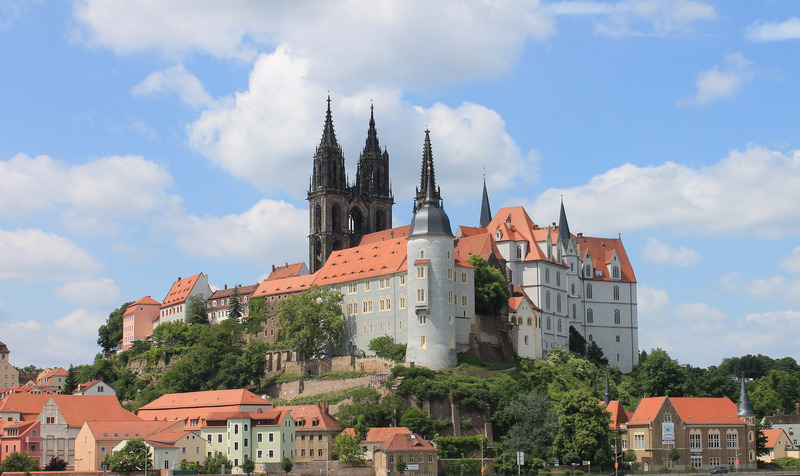 A visit to the stately Meissen Porcelain Factory and the Albrecht Castle is a must. 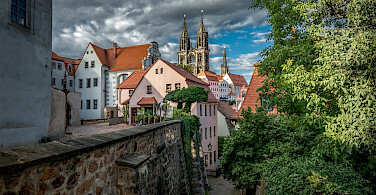 Stay overnight in or near Meissen. 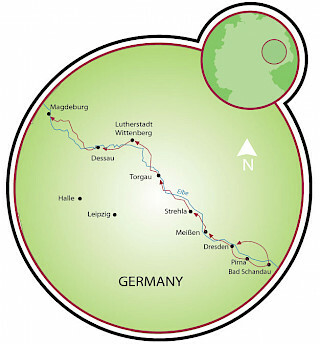 Ride along Germany’s northernmost vineyards to Diesbar-Seusslitz. Near the baroque castle and grounds are several places to stop in for a bite to eat and taste regional wines. Continue on past the former steel city of Riesa and on to Strehla. Strehla is an idyllic small city with over 1000 yrs of history. Spend the night in Riesa or Strehla. During WWII the United States Army and Soviet forces met on the Elbe River Bridge in Torgau. On your way to Torgau, you will cycle through Mühlberg where you may want to visit the Cistercian monestary. Enjoy the beautiful park in Trebnitz. Have a lovely evening and spend the night in Torgau. Along the Elbe on your way to Wittenberg you will pass Lichtenberg Castle and go through Pretsch. 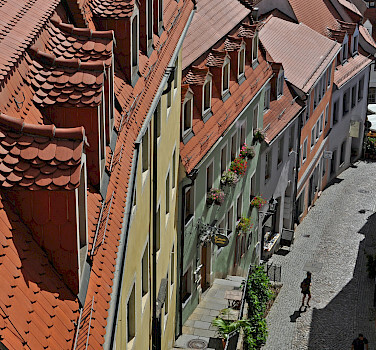 You may want to visit the ‘Lutherhalle’, the largest Reformation exhibition. 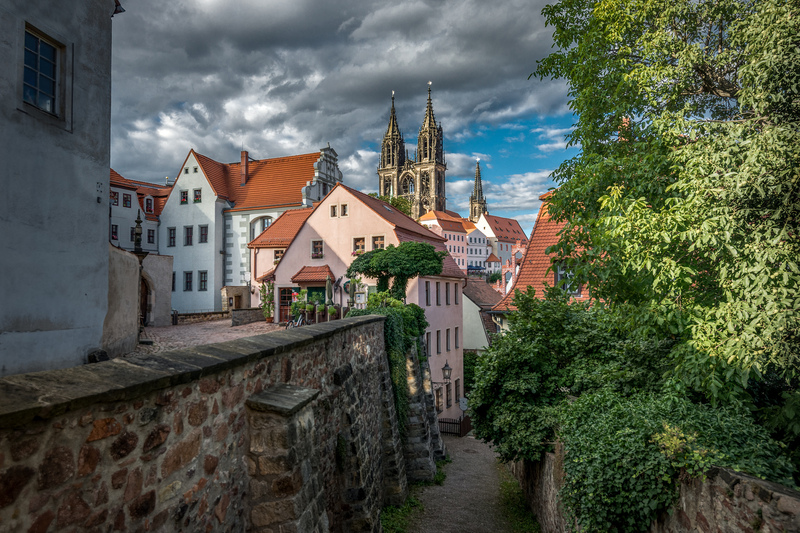 Imagine walking in Martin Luther’s footsteps. Stay overnight in Wittenberg. Cross the Elbe into Wörlitz. Wörlitzer Park was the first English landscaped park in continental Europe. It was created in the late 18th century under the regency of Duke Leopold III of Anhalt-Dessau and is 142 km² (54.8 sq mi). On your way to Dessau you can either cycle along the Elbe or through the little baroque city of Oranienbaum. The House of Ascania onced resided in Dessau. The city's acclaim stems from the renowned ‘Bauhaus’ architectural design movement which combined crafts and fine arts. Stay the night in or near Dessau. Today you'll cycle Elbe delta on your way to Aken. This small city was founded by Albert the Bear in the 12th century. 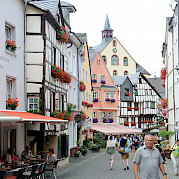 The old town is surrounded by a 700 yr. old city wall with 14 fortified towers and 3 city gates. Continue cycling to Barb where you'll stay overnight. Cycle through the towns of Gommern and Schönebeck before reaching today's destination, the beautiful city of Magdeburg. The green citadelle is really worth a visit. Overnight accommodations in Magdeburg. This tour is run by Mecklenburger Radtour. Some of the directions from the bike path to the hotel were not great. In 2 cases, when hotel was far from bike path, it was only with GPS in our phone that we were able to find our way. Loved having the meal plan where possible. Thanks for setting that up.